At Total Hockey Minnesota, we can help your Association or AAA Team gain that competitive edge you are looking for. Our facility is a "one-stop shop" for hockey development in all areas- skating, multi-tasking, strength training, etc. 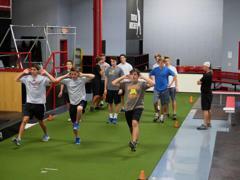 Our strength and conditioning coaches design hockey specific training programs that reflect the on-ice demands. Strength training programs are based on our highly successful off-season training program, the Intense Hockey Training Program. Programs are age specific and can be customized based on your team's need.